As for this recipe, I think you will also find it delicious. And it’s even better when you make it with a little love. As usual, I made a few changes to my own liking (especially with the chicken – I tend to prefer white meat over dark), but for the most part, the sauce is the same. While the chicken is baking, heat oil over medium heat in a large saucepan. Add onion and cook for 3 minutes or until translucent. Add garlic, and cook for 1 minute. Stir in cumin, cinnamon, sale, and pepper; cook for 1 minute. Add canned diced tomatoes and chiles to saucepan, and simmer for 10 minutes. Stir in tahini and chocolate until melted. Stir in chopped cilantro. Remove from heat and cool slightly. Put sauce in a blender or food processor until smooth. Spoon as much sauce as you like over the chicken. Serve with avocado and tomato. 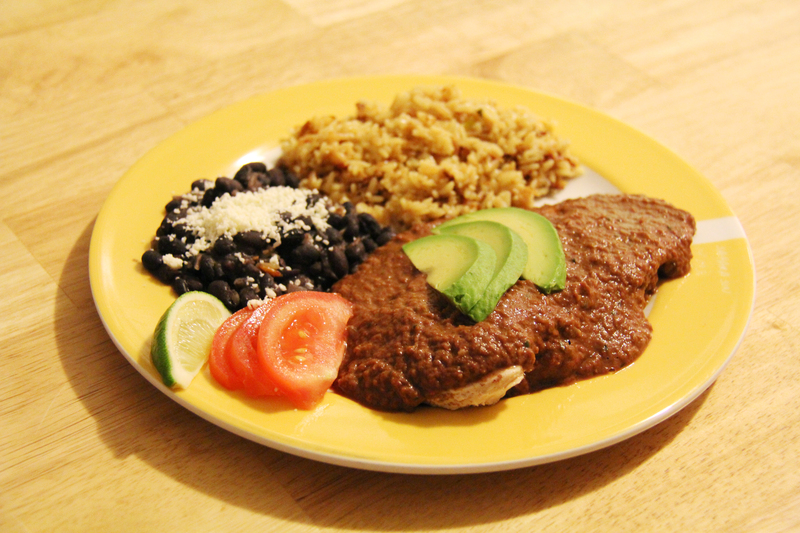 I also decided to serve it with some black beans and rice, which really completed the meal for me. The cheese on top of the beans is cotija. Happy to say, we blended everything all together to serve to our little guy as well, and he happily ate it as well!